The name ‘Deer Park’ was coined by its former inhabitants, who used to roam freely in the quiet rural neighbourhood. Deer Park has since developed into a bustling district of residential and commercial buildings. To pay homage to the namesake, a giant piñata will be set up in the lobby of 2 St. Clair West. Broadly, this is also a statement on calling the area a deer park, when none of that remains today. 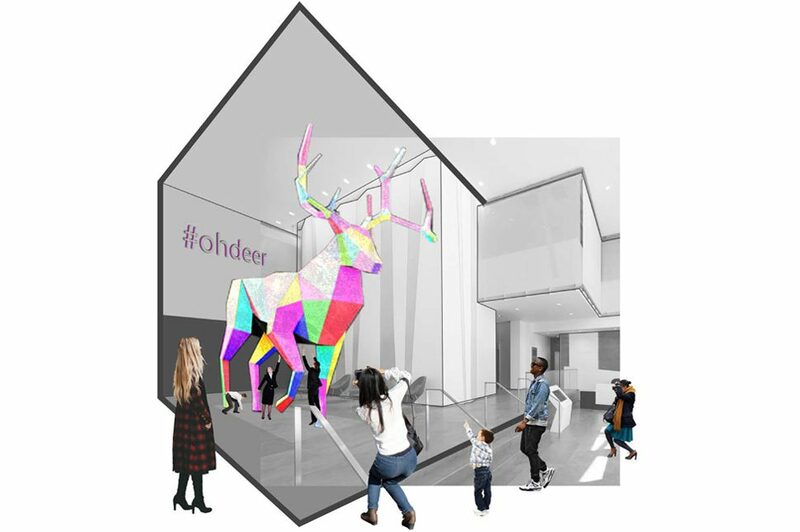 The deer motif is used as the inspiration of the massive vessel, and festival-goers will have the opportunity to be involved in revealing the surprises within it. Each evening during the week the piñata will be lowered, leading up to the final night when people can reach its belly and open the piñata. The piñata will be filled with confetti, balloons and treats. This is an amusing, playful and celebratory way to involve the community. Background image: A-Frame. Toronto + New York Architectural Photography. 2 St Clair West Lobby Renovation. Gensler is a global architecture, design and planning firm with 44 locations and more than 5,000 professionals networked across Asia, Europe, Australia, the Middle East and the Americas. Founded in 1965, the firm serves more than 3,500 active clients in virtually every industry. Gensler designers strive to make the places people live, work and play more inspiring, more resilient and more impactful. Gensler’s mission is to leverage the power of design to create a better world. Gensler is organized to support clients at every stage of the design cycle, from initial strategy and design planning through implementation and management. Unique among design firms, Gensler’s integrated network serves a cross-section of the global economy through 27 practice areas in our Work, Community and Lifestyle sectors. Gensler maintained the top position on Architectural Record’s Top 300 Architecture Firms for the sixth consecutive year. For their innovative leadership, our co-CEOs Andy Cohen and Diane Hoskins rank #25 on Business Insider’s elite “Creators” list – a who’s who of the world’s 100 top creative visionaries.